In recognizing the need to keep up with their customers’ digital lifestyle, international total logistics provider Royal Cargo constantly seeks innovative solutions to digitize operations. Through a partnership with Globe Business and its IT Enabled Services Group, the premier logistics company implemented the breakthrough paperless mobile solution, GoCanvas. Through GoCanvas, Royal Cargo was able to convert its pickup/dropoff, discrepancy, damage, and situation reports as well as many other paper forms to dynamic mobile applications that have far more functionalities than paper. Since users can capture information on any mobile device and send it to customers or colleagues in seconds, GoCanvas allows Royal Cargo to save on paper as well as processing time. Royal Cargo has over 35 years of experience in cargo transportation and handling, and has a global network of owned companies and trusted agents. Following its vision to become a world-class total logistics provider and its commitment to using up-to-date technology, the company acquired the GoCanvas licenses and has been using them successfully since 2014. With an improvement on the “Track and Trace” process through the instant updating of the system, Royal Cargo was able to implement a more efficient system of transporting goods — allowing a fast, live, and accurate transfer of delivery information through mobile solutions. The transition from a paper-based Proof of Delivery (POD) to an ePOD on mobile devices has enabled Royal Cargo to transmit details from a delivery destination to the system that updates the POD milestone accordingly with a touch of a button. Drivers are equipped with mobile devices like Android smartphones that allow them to capture critical information including actual date, time and location where the shipment was delivered, e-signature of the consignee, plus a real-time photo taken when the shipment was received. All the data collected from their mobile applications are instantly uploaded to the cloud and email to the corrected channels. This capability further strengthened the specialized logistics services being offered by the company including international and domestic freight forwarding, warehousing and distribution, projects and heavy lift, business process outsourcing, customs clearance and brokerage, liquid transportation, shipping agencies, trucking service, and logistics solutions for clinical research and development. “We realized the value of using GoCanvas mobile forms primarily for our PODs to customers. For the most important requirement — that the final link in the supply chain has to be updated and communicated in real time — we thought of utilizing GoCanvas and implemented ePOD with our deliveries,” shares Calvert ‘Abet’ M. Cabungcal, Vice President, Global IT of Royal Cargo Inc. “And today, we’re reaping the results of a faster and more accurate delivery of goods to our valued customers,” he added. Every GoCanvas mobile application is customizable through the “drag and drop app builder tool” and can incorporate functionality such as electronic signatures, image capture, dispatch, barcode scanning, GPS, push notifications, and access data such as parts catalogs, price lists, and customer records. Subscribers can start from scratch or choose from a wide variety of customizable Transportation and Warehousing mobile form templates available in the GoCanvas Application Store. Canvas eliminates paperwork, captures more information, and allows collected data to be shared instantly — anytime, anywhere. With the utilization of the GoCanvas mobile application, business customers that are going paperless can reap significant cost, productivity, and efficiency gains, saving up to 75 percent on paper costs alone and achieve significant annual productivity savings. 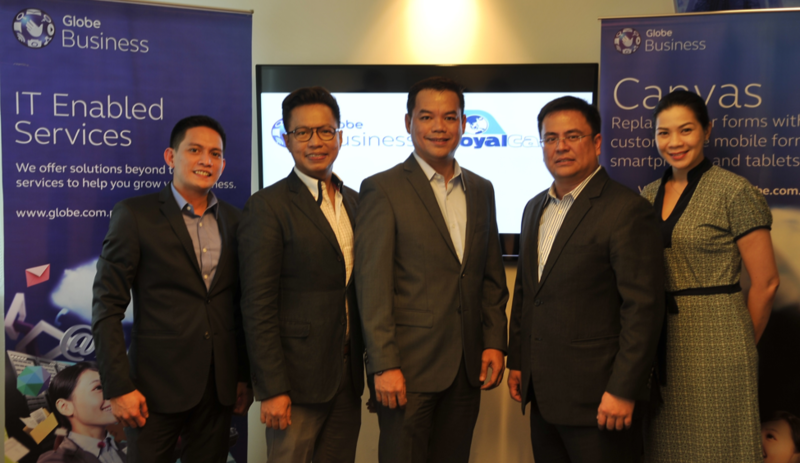 “With a service like GoCanvas, Globe is better able to provide companies like Royal Cargo with innovative solutions that help them better transition their existing business processes to a more productive and sustainable system,” shares Rey Lugtu, Vice President for IT Enabled Services at Globe. The collaboration between two global leaders in telco and mobile applications for business enabled Royal Cargo to implement innovative solutions that improve productivity, heighten collaboration, and generate quick returns on investment. About GoCanvas: GoCanvas provides an easy, fast, and economical way for businesses to find, customize, and create mobile forms to replace paper forms. GoCanvas is a cloud-based software service that enables users to collect information using mobile devices, share that information, and integrate it with existing backend systems. GoCanvas also offers the first mobile application store of its kind, allowing businesses from diverse industries to find and utilize mobile forms specific to their needs. Join the global leader in mobile forms and begin creating innovative solutions for your mobile devices today! To learn more, visit http://www.GoCanvas.com. About Globe IG: The IT Enabled Services Group (IG) of Globe Telecom serves the IT requirements of Philippine businesses from small and medium enterprises to large corporations, empowering them with a large platform of best-in-class infrastructure such as industry-accredited data centers, cloud solutions, and managed services as well as a complete portfolio of business applications like machine-to-machine and productivity tools. To learn more, visit www.globe.com.ph/business.